“Igloos”, an exhibition dedicated to Mario Merz (Milan, 1925–2003)—one of the most relevant post-war artists—brings together his most iconic group of works, the igloos, dating from 1968 until the end of his life. Curated by Vicente Todolí, and realized in collaboration with Fondazione Merz, the exhibition spans the whole space of the Navate of Pirelli HangarBicocca, placing the visitor at the heart of a constellation of over 30 large-scale works in the shape of an igloo: an unprecedented landscape of great visual impact. A key figure of Arte Povera, Mario Merz investigates and represents the processes of transformation of nature and human life: in particular the igloos, visually traceable to primordial habitations, become for the artist the archetype of inhabited places and of the world, as well as a metaphor for the various relationships between interior and exterior, between physical and conceptual space, between individuality and collectivity. These pieces are characterized by a metal structure coated in a great variety of common materials, such as clay, glass, stone, jute, and steel—often leaning or intertwined in an unstable fashion—and by the use of neon elements and wording. 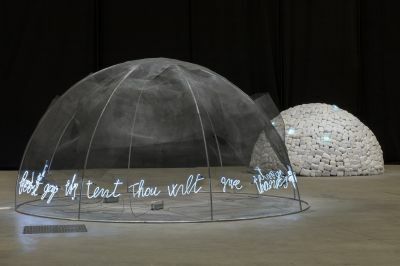 The exhibition provides an overview of Mario Merz’s work, of its historical importance and great innovative reach: gathered from private collections and international museums, the igloos will be displayed together in such a large number for the first time.